"introduced Ylopo to a firm that had never run a lead gen program. 5 transactions, have 3 listings, 6 escrows, and 24 pre-approved buyers. Ylopo has created believers in P-town!" Why Does Cory Love Ylopo? Beautiful branded websites with man unique features great for single agents and growing teams! See a Demo and get $500 FREE Advertising & Re-Marketing Budget! Ylopo is your one-stop shop for digital marketing online! VISIBILITY, TRANSPARENCY, and CONTROL! Ylopo has built the industry's first sophisticated digital marketing dashboard that's designed to be run in either Co-Pilot or Auto-Pilot modes. Co-Pilot is for our Ylopo clients who want to get their hands dirty and easily create and manage their own digital marketing campaigns and Auto-Pilot for those clients who want to leave all the digital marketing management and creation up to the experts here at Ylopo. 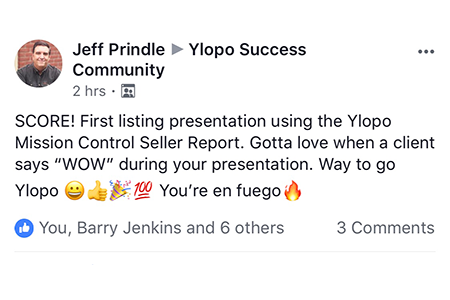 Ylopo’s best in class consumer home search experience will keep your prospects off the portals and keep them warm and engaged with you and your team. The Ylopo IDX home search platform was designed from the ground up to be mobile first. Ylopo’s mobile-optimized home search was engineered to perform at the fastest speeds and is continuously fine-tuned for optimum lead conversion. Integrate your brand, offers, and advertising partners into your own unique home search experience for a highly focused consumer experience. Start with one of our beautifully designed templates or let us create a completely customized website for you! We help make your site uniquely your own with an unparalleled amount of design flexibility. Ylopo’s branded websites scale as you scale. You can give each agent on your team their own microsite embedded within your more extensive team website. Ylopo’s team of expert copywriters and designers produce weekly infographic-style content that is automatically syndicated to your branded website and throughout your social media profiles. The future of marketing is dynamic advertising; ads that change based on what we can now predict the consumer wants to see! See how we create dynamic ads on social media! Facebook lead ads are designed to capture accurate consumer contact information and it's Facebook’s most significant ad product in years! Find out how we leverage Lead Ads for ALL of your advertising. Stay visible and “top of mind” in front of your entire sphere and everyone in the local markets that you're trying to dominate. Find out how we do this in an automated fashion for you! Fully automated marketing campaigns of your listings that are synced in real time with whatever happens to your listing on the MLS! 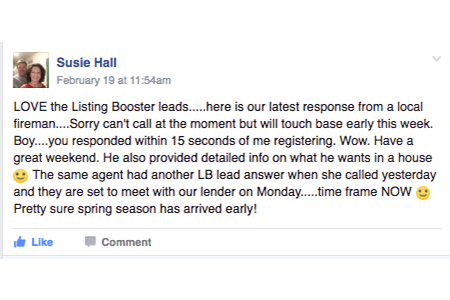 With Listing Rocket, we help you generate a ton of buyer leads, keep your seller thrilled with your marketing of their listing, and win more listings. See how we do it! With Listing Rocket, we don’t just create ONE ad. We create a series of UNIQUE ads over time for each lifecycle stage of your listing. Precisely target the demographic segments that you think will find your listing the most appealing...all with one click! We translate all of your marketing data into an infographic-style report that your seller clients can easily understand and will be sure to impress! 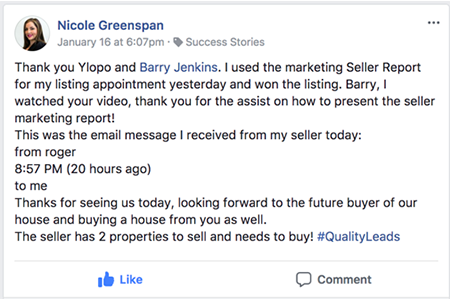 Ylopo analyzes every home that each buyer views and develops a daily personalized listing alert for each and every consumer! Ylopo’s priority lead algorithms are continuously scoring leads based on their home search engagement and interactions. Our system will immediately notify you as soon as one of your leads exhibits a priority behavior which warrants your immediate attention and action. With Ylopo, you will have an “assistant” that automatically texts your highest priority leads on your behalf. With this incredible nurture technology, we will get your best leads responding to you without you ever having to lift a finger! Don’t be held prisoner by one single “all-in-one” system that is trying to be all things to all people. Ylopo integrates with the best of breed Real Estate CRMs so we can focus on what we do best: digital marketing, digital branding, and lead nurture and cultivation. Ylopo has the most in-depth home search and digital marketing integrations with the real estate industry’s leading CRMs. Each partner is vetted carefully to make sure that they meet our highest standards for performance, user experience, and data integration.